Antoni van Leeuwenhoek (1632-1723) was famous for his microscope lenses and his research correspondence. Around 1653 he bought 'Het Gouden hoofd' (The Golden Head), a house at Hippolytusbuurt no. 7 for which he paid 5000 guilders. To the right a portrait painting of Van Leeuwenhoek by Jan Verkolje. The same portrait was also issued by the artist as a print. Copyright Rijksmuseum, Amsterdam. The original house and door of the Van Leeuwenhoek house at number 7 have disappeared. The present day (year 2000) plaque is on the wrong house ; it should be to the left side of the entrance of the present day 'Deen' store. Another commemorative plaque is at the corner of Oude Delft and Boterbrug. 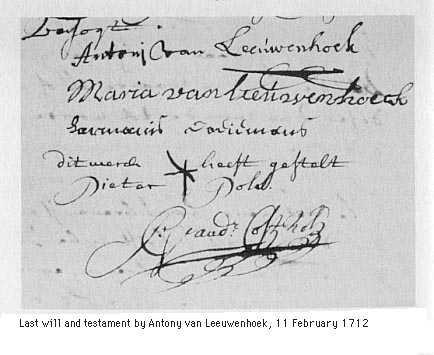 To the right: Decision dated 1676, by the Lords Aldermen of Delft, to install Antony van Leeuwenhoek as curator of the Vermeer estate of Catherina Bolnes. Czar Peter the Great of Russia visited Delft in 1697 and there Van Leeuwenhoek showed him the blood circulation in the tail of an eel. Harvey had already formulated this circulation theory in 1628. Note. Research by Marten Jan Bok, 1999. The Leeuwenhoek signature is from a book issued by the Delft historical society Delfia Batavorum: Facetten van Delft, Gedenkboek van het Genootschap Delfia Batavorum 1935-1985, H.K.L. Houtzager, red.